"That treaty took our people away from their homeland. Each and every one of us has someone they lost on that trail," said Richard French, a member of the Eastern Band Tribal Council. One hundred eighty years ago, Cherokee leaders signed an agreement. It laid the groundwork for the Trail of Tears. Now, for the first time, Cherokee leaders were shown the original. “It was a little emotional for me. I'm a direct descendant. My fourth great-grandfather had signed the treaty," said Catherine Foreman-Gray, history and preservation officer of the Cherokee Nation. "Knowing the impacts of that treaty, knowing the intentions of the men, it's a very complicated and complex story when you start talking about Cherokee removal." This painful chapter began in 1830, when more than 125,000 indigenous people lived across the Southeastern U.S. But white settlers wanted valuable farmland in the area. The Indian Removal Act, signed by Andrew Jackson in 1830, made it legal to trade native land for less desirable property west of the Mississippi. Before the Cherokee, other tribal nations had already been forced to leave. In 1831, it was the Choctaw Nation. In 1836, the U.S. Army forcibly removed the Creek Nation. At about the same time, in 1835, the Cherokee leaders signed the Treaty of New Echota. It said the Cherokee people would leave their home. In exchange, they'd get land in the West and $5 million from the United States government. But many Cherokee tribal members refused to leave. U.S. soldiers forced them out, sparking the thousand-mile long march West through brutal conditions. Four thousand Cherokees died. "Twenty percent of our population perished, died on that Trail of Tears," said Bill John Baker, principal chief of the Cherokee Nation. "I don't think anyone can imagine 25% of their relatives dying over a forced removal." "The group that signed this treaty, they realized that no matter what we did, we weren't going to be able to hold on to our homelands. So they started advocating for removal," said Foreman-Gray. 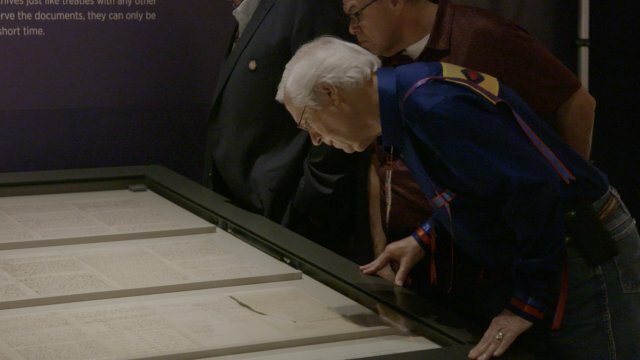 Almost immediately, thousands of Cherokee people called the treaty a fraud. More than 2,000 signed a petition demanding Congress void the agreement. But in 1836, the Senate ratified it anyway — by one vote. "A lot of people think the federal government just uprooted us and moved us West, but what they did is sow a lot of division. After they signed that, there was a lot of what we often call the 'Cherokee civil war,' ensued after that and lasted for years," said Foreman-Gray. This treaty is one of 377 agreements between the United States and native nations. Each one is preserved in the National Archives, rotated into public display for a short time, then returned to storage. They are living documents, still legally valid today. But the promises weren't often kept. Now, more than 365,000 Cherokee citizens live across the U.S., in all 50 states. "The more we can tell our story, the less likely that history will repeat itself," said Chief Baker.